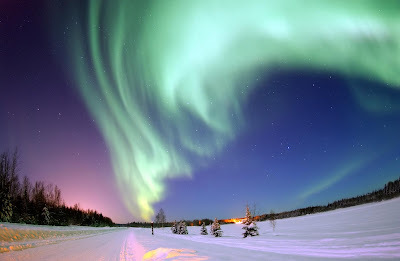 An aurora (plural: auroras or aurorae) is a natural light display in the sky particularly in the high latitude (Arctic and Antarctic) regions, caused by the collision of energetic charged particles with atoms in the high altitude atmosphere (thermosphere). The charged particles originate in the magnetosphere and solar wind and, on Earth, are directed by the Earth's magnetic field into the atmosphere. Aurora is classified as diffuse or discrete aurora. Most aurorae occur in a band known as the auroral zone which is typically 3° to 6° in latitudinal extent and at all local times or longitudes. The auroral zone is typically 10° to 20° from the magnetic pole defined by the axis of the Earth's magnetic dipole. 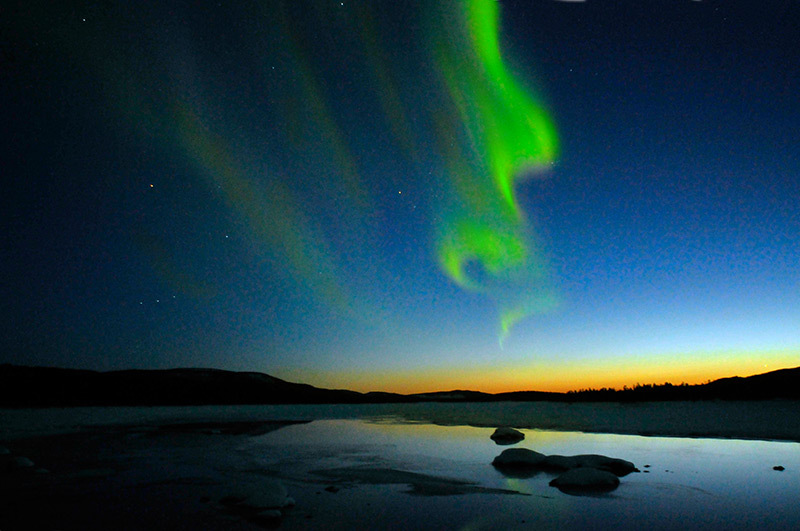 During a geomagnetic storm, the auroral zone will expand to lower latitudes. 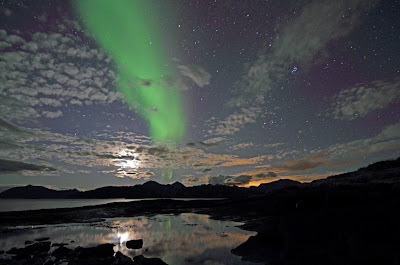 The diffuse aurora is a featureless glow in the sky which may not be visible to the naked eye even on a dark night and defines the extent of the auroral zone. The discrete aurora are sharply defined features within the diffuse aurora which vary in brightness from just barely visible to the naked eye to bright enough to read a newspaper at night. Discrete aurorae are usually observed only in the night sky because they are not as bright as the sunlit sky. Aurorae occur occasionally poleward of the auroral zone as diffuse patches or arcs (polar cap arcs) which are generally invisible to the naked eye. In northern latitudes, the effect is known as the aurora borealis (or the northern lights), named after the Roman goddess of dawn, Aurora, and the Greek name for the north wind, Boreas, by Pierre Gassendi in 1621. Auroras seen near the magnetic pole may be high overhead, but from farther away, they illuminate the northern horizon as a greenish glow or sometimes a faint red, as if the Sun were rising from an unusual direction. Discrete aurorae often display magnetic field lines or curtain-like structures, and can change within seconds or glow unchanging for hours, most often in fluorescent green. 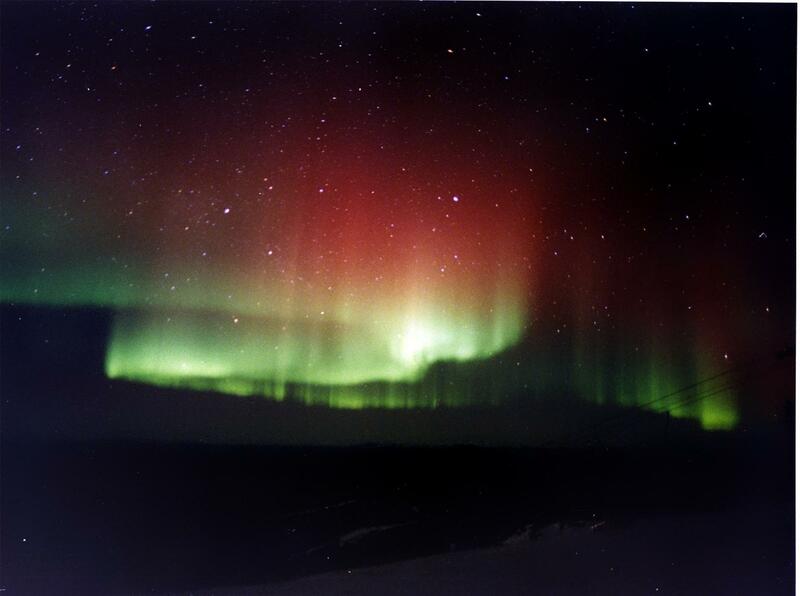 The aurora borealis most often occurs near the equinoxes. The northern lights have had a number of names throughout history. 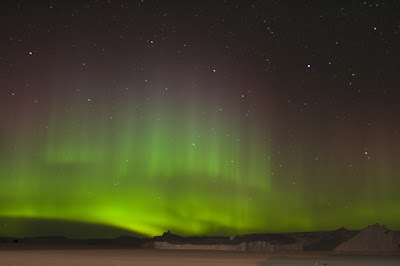 The Cree call this phenomenon the "Dance of the Spirits". In Europe, in the Middle Ages, the auroras were commonly believed a sign from God (see Wilfried Schröder, Das Phänomen des Polarlichts, Darmstadt 1984). Its southern counterpart, the aurora australis (or the southern lights), has almost identical features to the aurora borealis and changes simultaneously with changes in the northern auroral zone and is visible from high southern latitudes in Antarctica, South America and Australia. Aurorae occur on other planets. Similar to the Earth's aurora, they are visible close to the planet's magnetic poles. 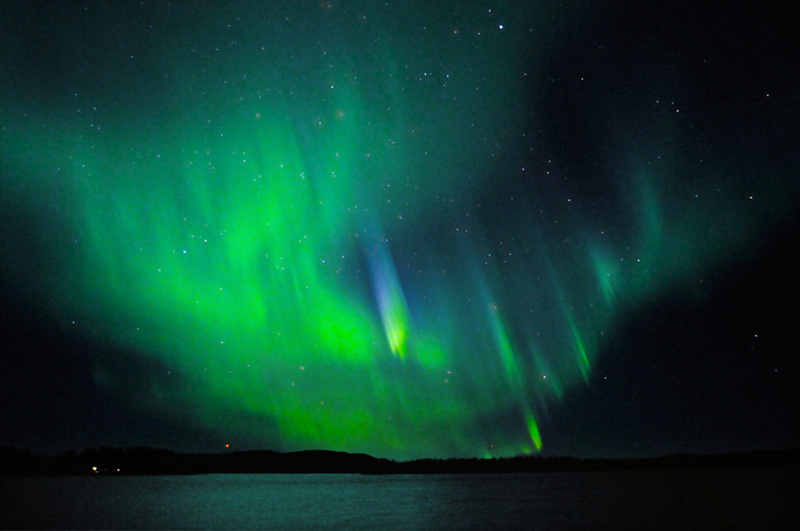 Modern style guides recommend that the names of meteorological phenomena, such as aurora borealis, be uncapitalized. This is why there is a colour differential with altitude; at high altitude oxygen red dominates, then oxygen green and nitrogen blue/red, then finally nitrogen blue/red when collisions prevent oxygen from emitting anything. Green is the most common of all auroras. Behind it is pink, a mixture of light green and red, followed by pure red, yellow (a mixture of red and green), and lastly pure blue. The aurora borealis shines above Bear Lake, Alaska. Red and green aurora in Fairbanks, Alaska. Northern lights with very rare blue light over Moskosel, Lapland in Sweden. 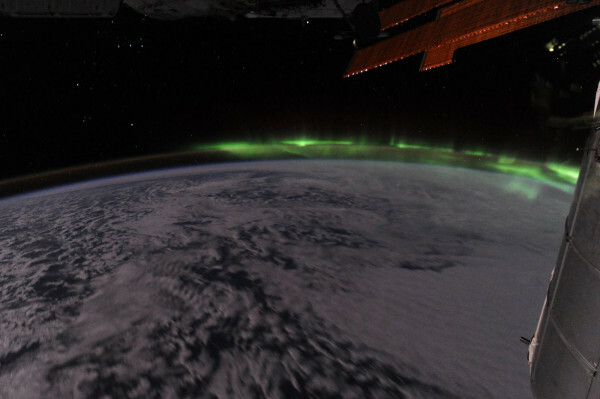 View of the aurora australis from the International Space Station.